Annandale, VA -- System Support Products, Inc. announces the availability of Release 2 of Stock Calculator for Apple Mac OS X. Stock Calculator is a profit/loss and share price calculator application. Stock Calculator is also ideal for performing 'what if' analyses, such as determining what share price a stock needs to attain in order to return a specified profit. 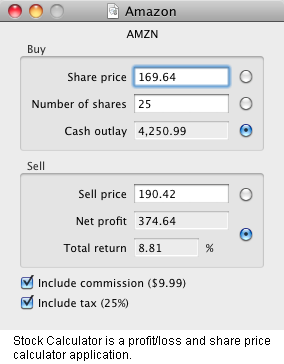 When buying stock, Stock Calculator can determine the total cash outlay, per share buying price, or number of shares. When selling stock, Stock Calculator can determine the net profit amount and total return percentage, or the per share selling price. Stock Calculator for Mac OS X is currently available for a one-time charge of $14.95 (USD) from the System Support Products, Inc. web site. Registered users of Stock Calculator who have purchased within 6 months prior to this announcement will be provided with the new release free of charge. Other registered users will be offered Release 2 for an upgrade charge of $8.